One of the ways I justify my bountiful and frequent purchases at used book sales is by telling myself, I am buying this book to save it from being discarded or forgotten. An out-of-print book by one of my favorite authors and illustrators is a must-buy when I find it. You might find this to be silly thinking, but truly it is something I worry about. What will happen to the book if I don't buy it and others pass on it too? Last week, I was at our local library checking out a stack of books by Trina Schart Hyman, and I mentioned to the librarian that our family would be celebrating her birthday. She replied, "When I was in librarian school, her books were loved by everyone!" 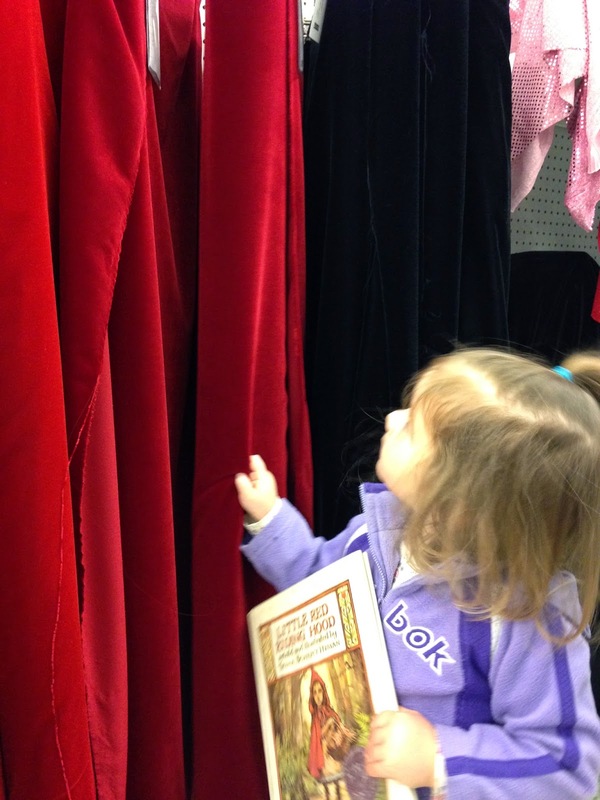 I was not surprised by her enthusiasm and told her how excited I was to find some of her books at a recent used book sale. (Meet Guguze by Spiridon Vangheli, illustrated by Trina Schart Hyman was my favorite find!) Then, I shared with her the reason behind my obsession of buying older out-of-print books. She reassured me by saying that she is committed to keeping older titles, by authors and illustrators like Trina Schart Hyman, in circulation at the library. I told her that I noticed her efforts and thanked her for keeping great books around for a little bit longer. Trina Schart Hyman illustrated over 150 books for children during her lifetime including four books that received Caldecott recognition; Little Red Riding Hood, Caldecott Honor (1984), Saint George and the Dragon by Margaret Hodges, Caldecott Medal (1985), Hershel and the Hanukkah Goblins by Eric A. Kimmel, Caldecott Honor (1990), and A Child's Calendar by John Updike, Caldecott Honor (2000). Trina Schart Hyman described the time when she first discovered she wanted to be a children's book illustrator, "I figured out at four years old that somebody had made the pictures in my books and though I didn't know what these people were called, I knew I wanted to be a book illustrator...I began to make books from my own stories and drew pictures to illustrate them."(R. Michelson Galleries). 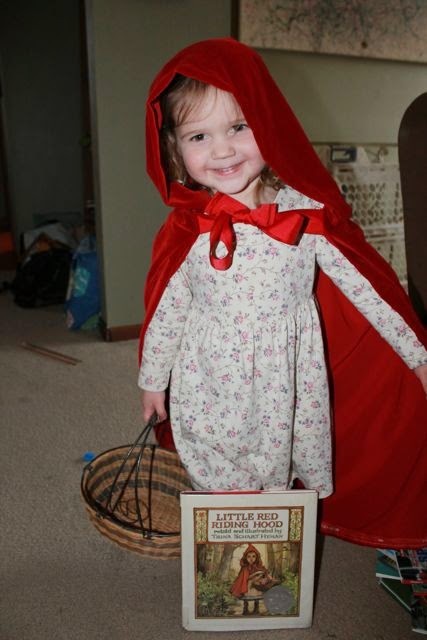 Her father helped nurture her love of stories, "My father told the best stories. He sometimes took me for walks at night and told me long magical stories of the origins of stars. My father's made-up mythology is still more interesting than the stories the scientists have invented. (Meet the Authors and Illustrators, Kovacs, Deborah and Preller, James). Her formal art training began at the Philadelphia Museum of Art in 1956, continued at the Boston Museum School of Fine Arts in 1959, and lastly at the Swedish State Art School in Stockholm in 1960. In Sweden, she landed her first job illustrating a children's book, Toffe och den lilla bilen (Toffe and the Little Car). Once she was back in the United States it didn't take long for Trina Schart Hyman's career to get rolling and soon she was illustrating multiple books every year. Then in 1971, while continuing to illustrate children's books, she began working for Cricket magazine and served as their art director until 1979. "I don't do sketches, or preliminaries. I think about it instead. I think about the story and about what it means and about how it can be brought to life in pictures. I think about the characters and what makes them tick and where they're coming from and where they might be going to. Trina Schart Hyman passed away in 2004. She will be remembered for her award winning picture books, for the impact she made on fellow illustrators, and for bringing to life classic stories like The Sleeping Beauty, Snow White, Rapunzel, and Little Red Riding Hood. 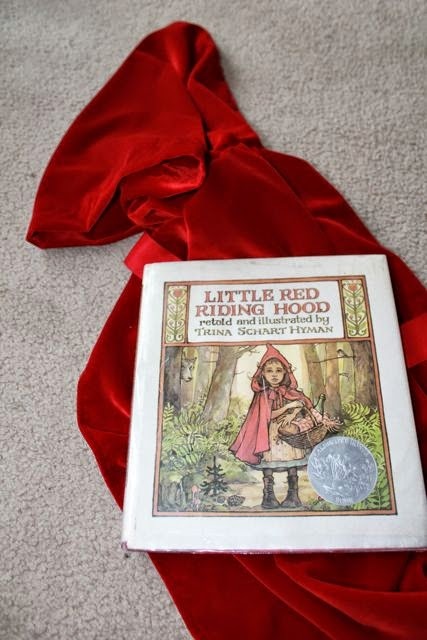 According to Meet the Authors and Illustrators it was Little Red Riding Hood that "held a special place in Trina Schart Hyman's heart, "It was so much a part of me that I actually became Little Red Riding Hood. 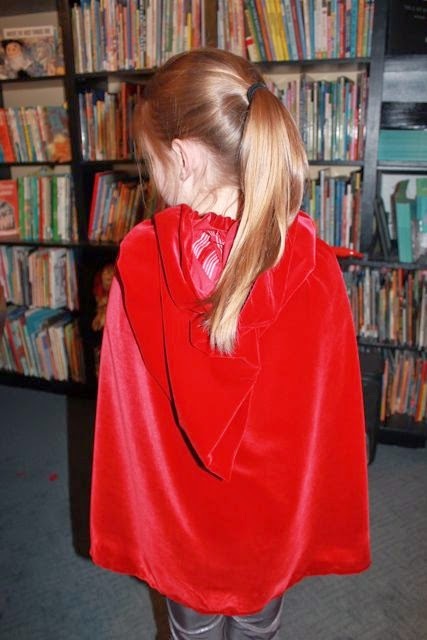 My mother sewed me a red satin cape with a hood that I wore almost every day. My dog, Tippy, was The Wolf." When I read this quote I knew exactly what I wanted to do with my youngest daughter to celebrate Trina Schart Hyman's birthday. 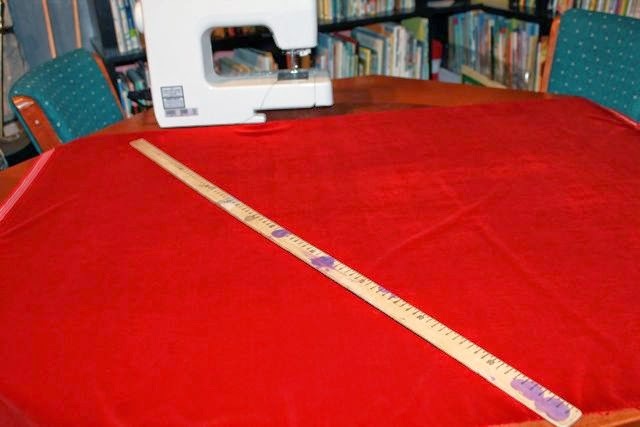 We went to Joann Fabrics to find red velvet to make a Little Red Riding Hood cloak to bring to life Little Red Riding Hood by Trina Schart Hyman. We found there is different qualities of red velvet. My daughter said, "I don't want that one. I want this one. It feels sooooo soft." It was $19.99/yard but we had a 50% off coupon. $10 to make a cloak sounded pretty good to me! 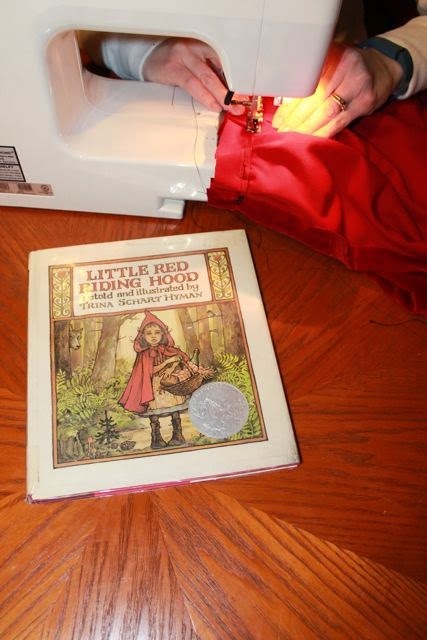 I researched many different blogs and sewing websites to find the easiest way to make Little Red Riding Hood cloak. I really liked the general plan from Do-it Yourself Divas. However, I knew this project was a little out of my sewing comfort zone. Thankfully, my wife was more than willing to help out. She marked on the back of the red velvet with chalk to determine where to cut. The smaller piece would become the hood and the larger piece would become the cape. 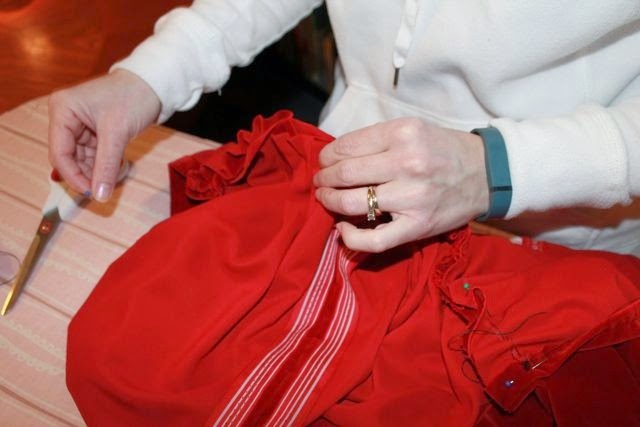 She hemmed around the edges of the cape to prevent fraying. 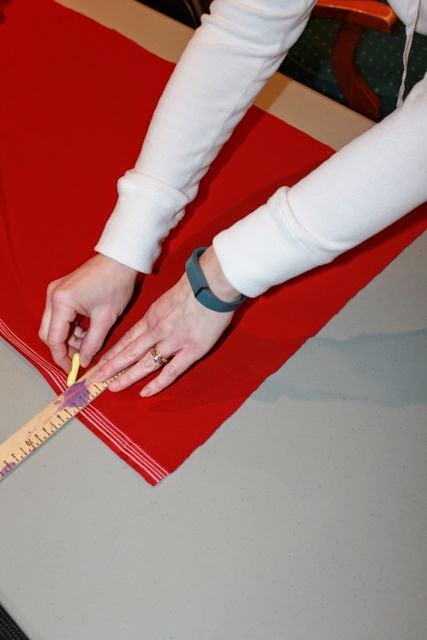 Before making one more cut in the smaller piece, we measured the piece of fabric on my daughter's head. The last cut left us with a small piece of scrap which was all we had from this project! 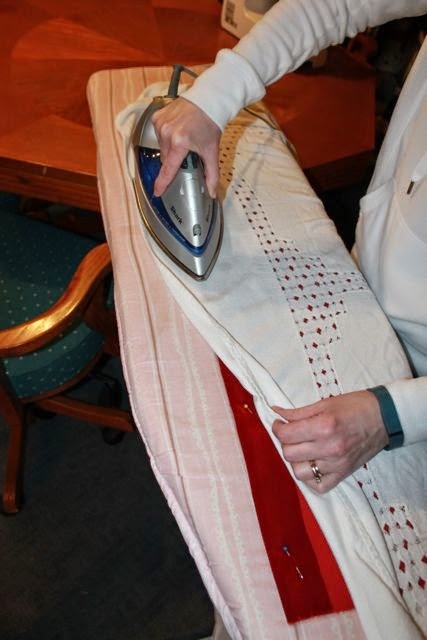 Before any hemming was done, my wife ironed the fold. 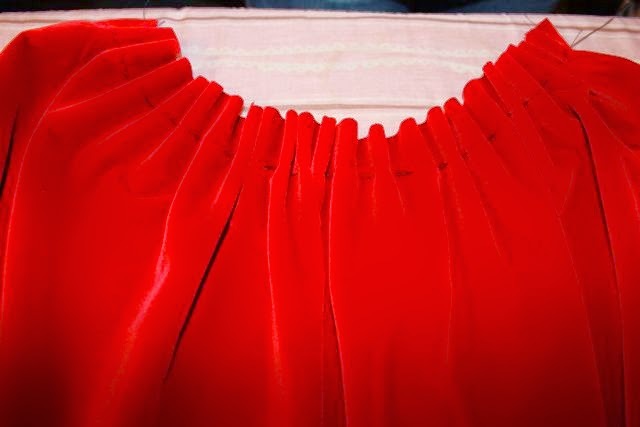 Do not directly iron your red velvet. 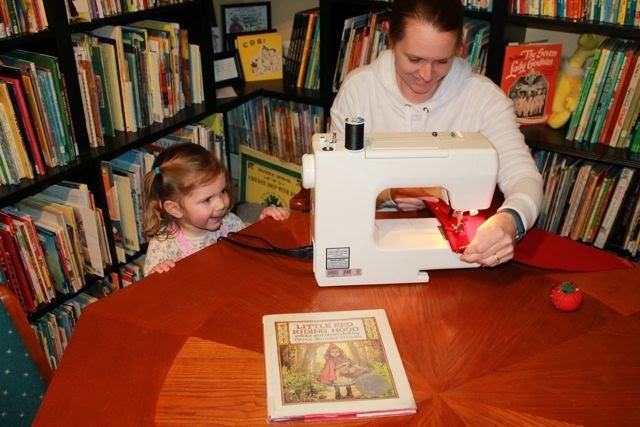 My daughter watched as her mom used the sewing machine. 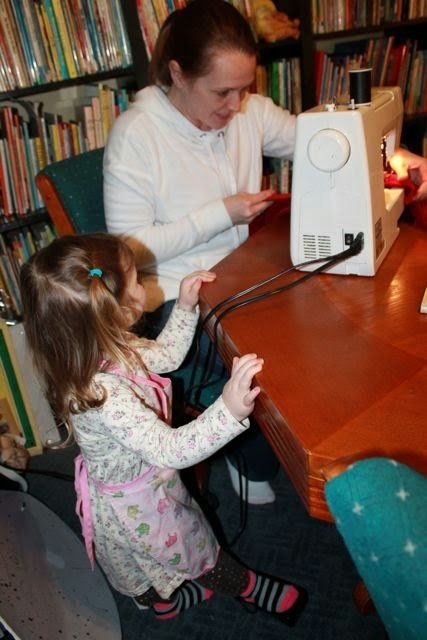 She was excited to press the foot pedal to make the sewing machine go! We wanted the cape the gather around the hood. 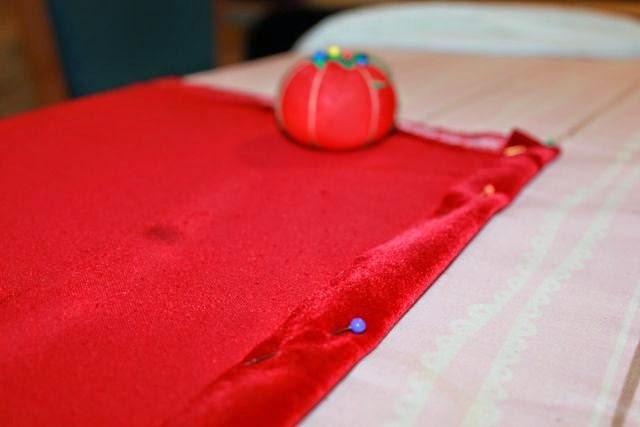 My wife hand-sewed the basting stitch. Here is the cape gathered and ready to attach to the hood. Straight pins held the cape and the hood together. 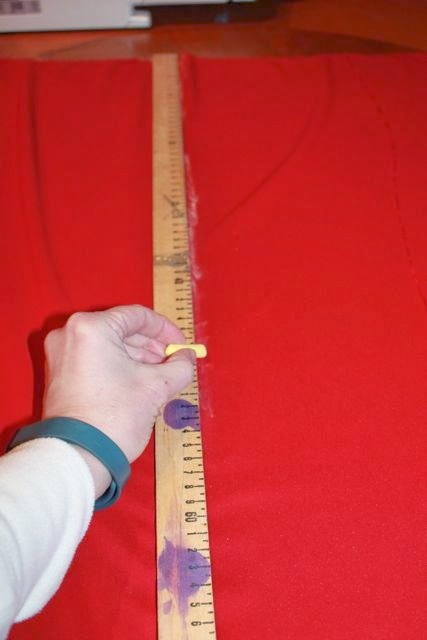 A straight stitch was sewn to attach the hood to the cape. 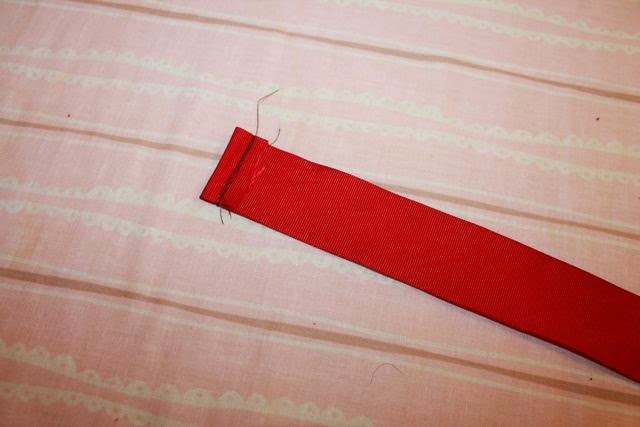 Lastly, red ribbon was added to each side of the neck area. Ties would be necessary to keep the cloak closed. 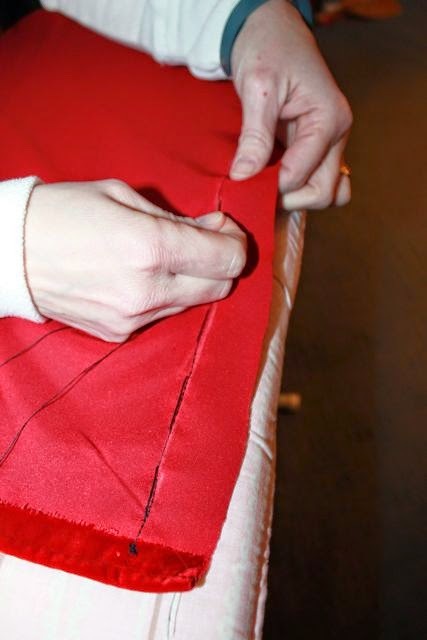 We folded and tacked the end of the ribbon to prevent fraying. 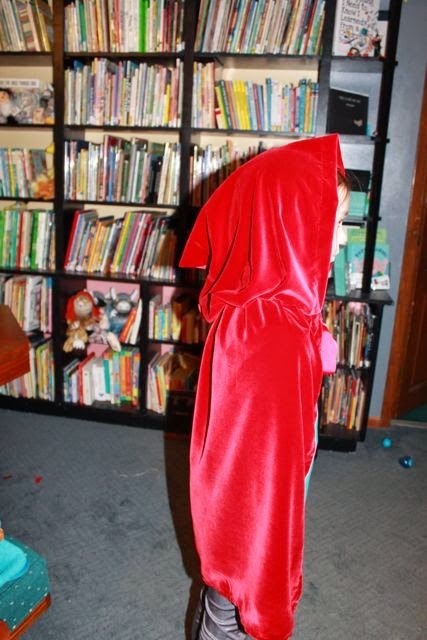 My oldest daughter modeled Little Red Riding hood cloak when it was finished. In the background, you can see my obsession for buying used books has blessed us with quite a few! Please Pin this picture on Pinterest! 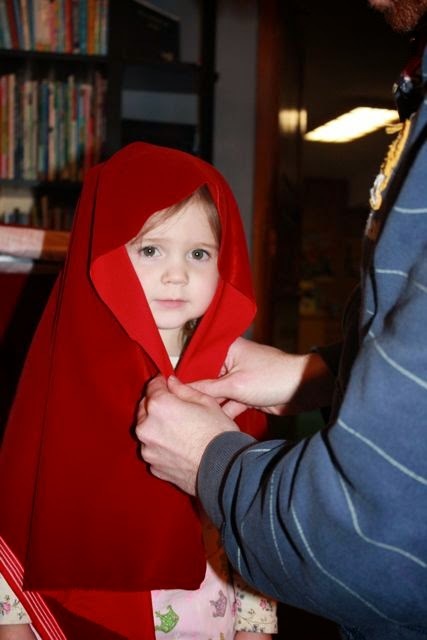 DIY Little Red Riding Hood cloak! There were many egg hunts this week. This made it was easy to find a basket in our house. 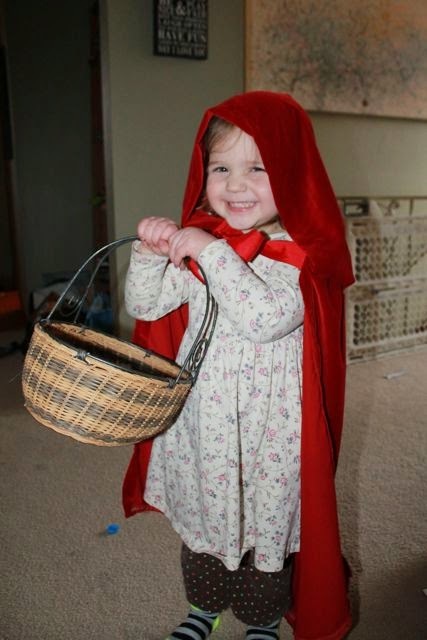 The cutest Little Red Riding Hood ever! 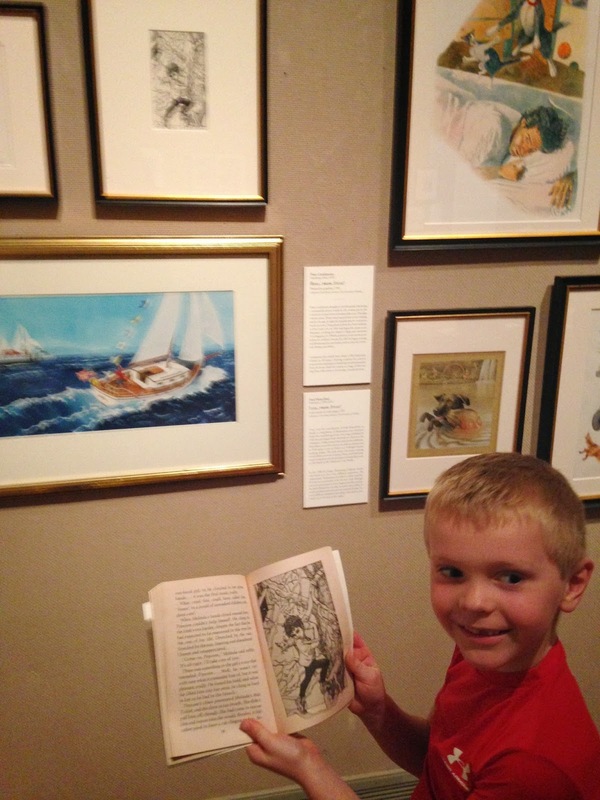 This week for Spring Break, we planned a road trip to the Toledo Museum of Art. 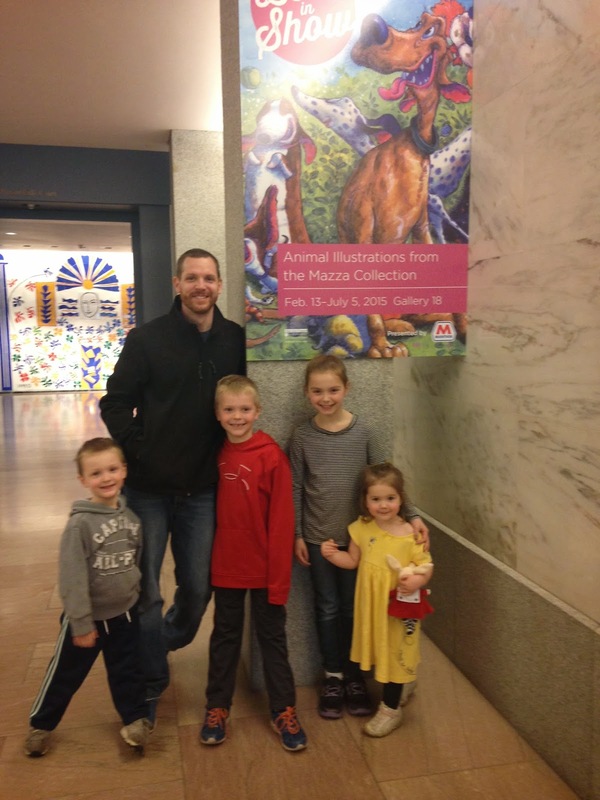 The reason for the visit was to see the BEST IN SHOW exhibit featuring animal illustrations from the Mazza Museum Collection. 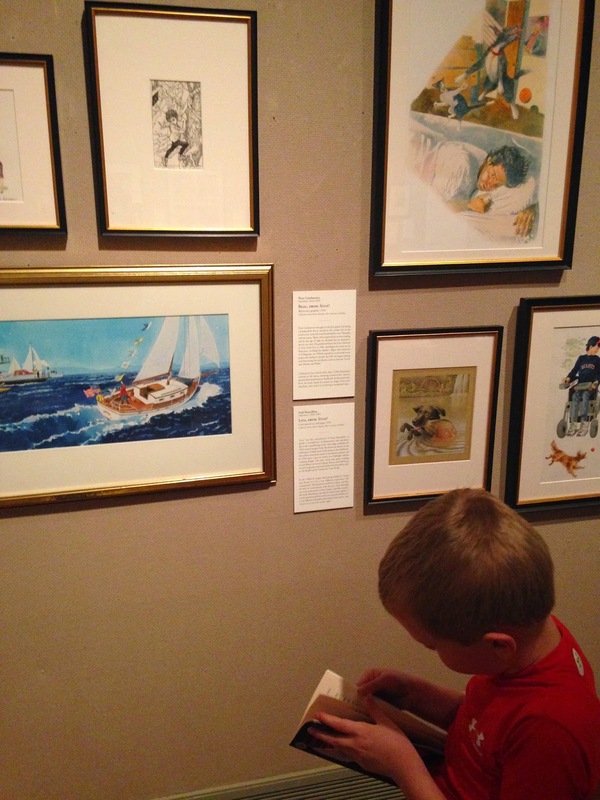 A visit to the Toledo Museum of Art is a fun and FREE family activity! The BEST IN SHOW exhibit has over 50 works of art. Get to the Toledo Museum of Art will by July 5, 2015! 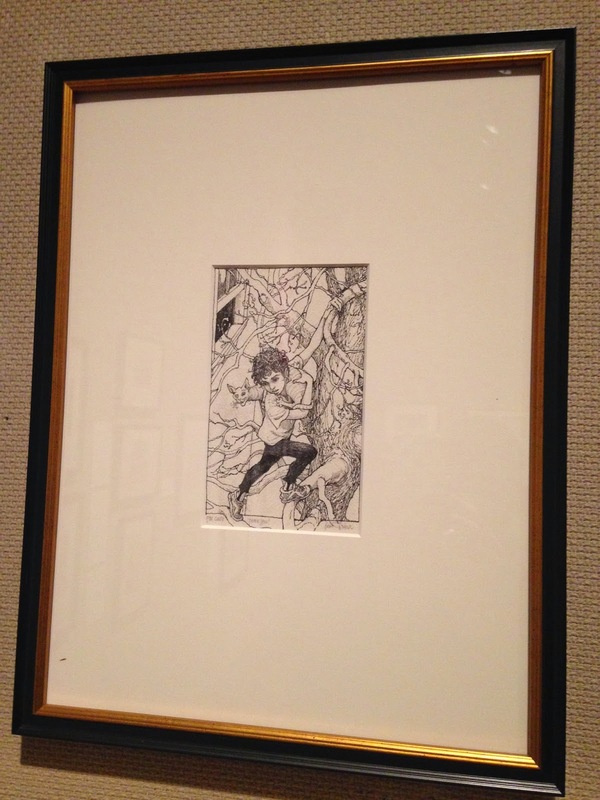 We were lucky to find one of Trina Schart Hyman's illustrations! It was perfect timing for our birthday celebration! This pen and ink illustration by Trina Schart Hyman is from Ghost Eye, a chapter book by Marion Dane Bauer. The books that coincided with each piece of art were available to read. My son was excited to find the page that featured the original illustration. I am so thankful for the Mazza Museum! Their efforts are perserving artwork from the best children's books for future generations to enjoy!